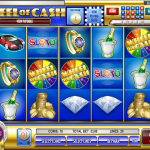 Wheel Of Cash is a 5 reel 20 paylines slot game released in 2007 by Rival. It is not hard to guess where they got their inspiration from so if you like the TV show then consider playing this game. Everything here screams like an 80s TV show so this is for all of you fans of the genre. The Wild in this game is the Gold Lottery Ticket symbol which will substitute other symbol to create a winning combination. There are also two scatters here. The first one is the Curtain symbol. 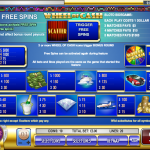 Landind 3 or more anywhere on the reels will reward you with 5 Free Spins. The multiplier for those wins is 5x with a chance to re-trigger the Free Spins when landing more scatters. 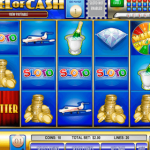 Sloto Game – This is an extra feature in the game and can simply be accessed by clicking the “Enable” button in the top right corner. It does cost an extra $1 to play it so it is simply up to you. You need to pick 5 numbers from the ones available or use the “Random Pick” option. 5 balls will then be picked. getting 3, 4 or 5 matches will win you $3, $10 or $1000. Not too bad for a $1 investment. Wheel Of Cash is kind of an old game with very basic graphics but except of that we actually really liked this game. It is fan, fast and engaging just as a tv show can be. The extra features are great and the RTP is not bad at 96%. You should give it a go! If you want to play a game taking place underwater then you should consider playing Whale O’Winnings a 5 reel slot by Rival.